They must find a way to get themselves to Hampton, Iowa for the weekend. They must blog about their experiences. If they do those two things, the entire weekend (Friday-Sunday) is taken care of for them - lodging, food, entertainment, etc. A few things the bloggers did over the weekend this year include going on a tour of the Old Stone House, toured the REA plant, went star gazing while sampling wine from a local winery (Town's End Winery), went on a tour of the Franklin County Historical Society Museum and Grandpa's Farm, went shopping in downtown Hampton, went to the Windsor Theater for a live Vaudeville show, and participated in the Harriman-Nielsen Historic Farm Fall Festival. I was happy to be able to join the group for awhile on Saturday while they focused on agriculture. To start with, the group traveled to Latham Hi-Tech Seeds and heard from the North Central Iowa Ag in the Classroom staff about the program, as well as went through a couple of the lessons that they do for kids in local schools. Then the group went on a tour at Latham's. Following the tour, the group went to the Roy Arend's Farm, where they got to go on tractor and combine rides. It was great to interact with the bloggers. They had a lot of great questions about agriculture in Iowa. 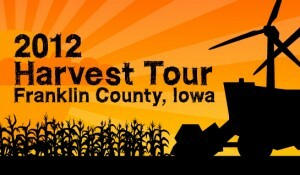 The Harvest Blogger's Tour is a great opportunity to not only promote tourism to Franklin County and Iowa, but it is a great chance to spread the messages of agriculture to new audiences through the bloggers followers. I can't wait to see what results from this year's Harvest Blogger's Tour and I can't end this post without linking my requested Sweet & Spicy Hog Wild Baked Beans recipe! How fun!I think I'd be the only one here in my area to do something like this, so it would be a pretty short tour, hahaha. If you can pool your resources together you could do something similar! We use several groups and businesses in our county to make a great weekend happen. Our county has a lot of pride so everyone is usually all for helping in with whatever the planning committee needs. Most bloggers that come to our weekend are travel bloggers. There is one person on the planning committee and all they do is work on getting eight bloggers to attend. I'm sad I was busy for this! One of my blogger friends invited me, and it was like a day before, so I missed it. We'll be doing it again next year so we'll be sure to have you on the invite list again and send you information right away!